High-torque exhaust in a subtle design. Provides considerably more top speed. E-certified. This Tecnigas Scooter Performance Muffler is for those who need a new exhaust and want more power but do not want to ride with a small and particularly sporty sounding exhaust on their scooter. very good torque curve and excellent performance on 50cc and 70cc Sports cylinder. 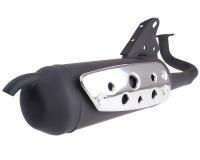 This Tecnigas Silent Pro exhaust system fits all CPI / Keeway up to 2003 Note. If the exhaust is E-certified, it means it is restricted and can easily be used as a stock replacement without a power increase. The restrictor is welded into the exhaust manifold. Removal of the restrictor increases performance, but negates the general operating permit (ABE). For MuZ Mosquito RX, MuZ Mosquito 50cc sold in the USA by Motorrad North America, CPI Oliver, Jag Powersports Oliver 50cc.